June is a terrific month to visit the Fuqua Orchid Center. Three outstanding orchid groups flower simultaneously: Laelia purpurata, Stanhopea and the Tulip Orchids (Anguloa). 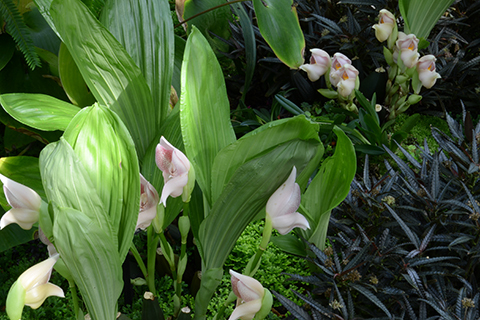 This week you can see several Tulip Orchid species, including Anguloa virginalis and uniflora, pictured below growing side by side in the Tropical High Elevation House. 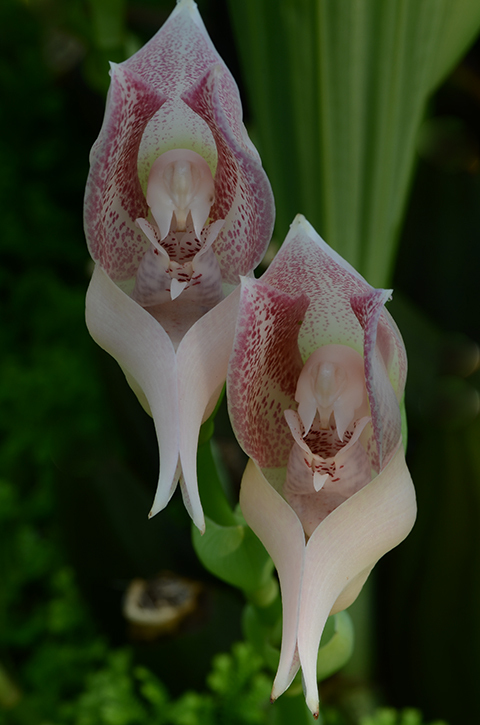 In Peru these two species are often found growing together according to Henry Oakeley's book, Lycaste, Ida and Anguloa. 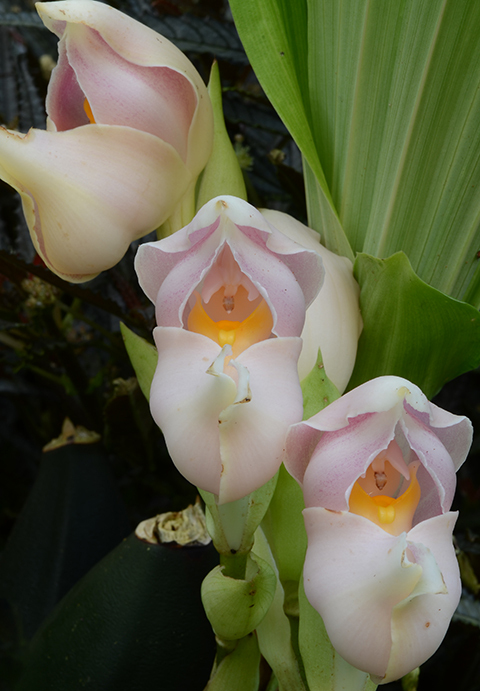 Both species grow as terrestrials or lithophytes in Andean tropics at about 1200 to 1500 m. Anguloa uniflora is endemic to Peru and it grows in extremely variable habitats--dry sunny slopes to moist dappled woodlands, writes Oakeley. Anguloa virginalis occurs over a wider geographical range Colombia, Venezuela, Ecuador, Peru and Bolivia often in full sun. Cool and sunny is a big challenge in our greenhouses in summer. As our summers grow hotter more of our anguloas have begun to migrate permanently from the intermediate back up greenhouse to the Tropical High Elevation House. Tulip Orchid fragrance will surprise you. It's Elmer's paste with a hint of menthol, an enticing aroma to male bees of certain species in the genus Eulaema. They collect the liquid fragrance by scratching the flower lip. The fragrance may be used to attract female Eulaema bees. Anguloa is sometimes called the Cradle Orchid, in reference to movement of the lip, visible in the photo (above) edged with yellow. When a bee alights on the hinged lip his weight causes it to rock backward, pushing him up against the tip of the column and in contact with the pollen masses. The bee often leaves the flower with the pollen attached to his thorax. It's easy to rock the "cradle" using your fingertip. 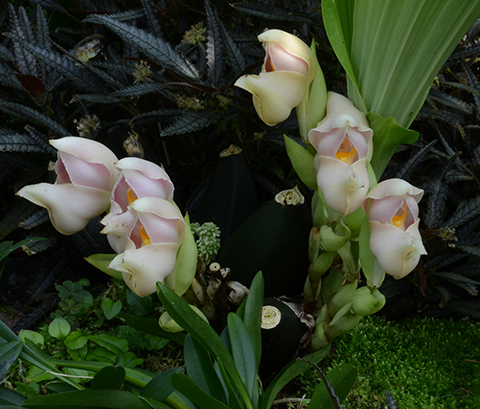 The journey of these two Tulip Orchids from the Andean rainforests to the 18th century Spanish court of Carlos III is a story with an Indiana Jones flavor. More about that in an upcoming post.